A group of Burdett School students recently learned a bit about the ins and outs of home decorating. With the guidance of teacher, Ingrid Dekker, the girls learned about colour schemes, how to decorate large spaces, and the cost of decorating a home. Pictured above are (From rear to front): Anna Hamm, Eva Fehr, Suzie Hamm, and Lissa Hamm. Also participating were Amanda Wiebe, Nellie Wall, Aganetha Knelsen, and Amy Froese. 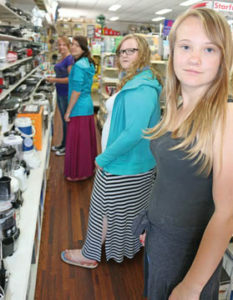 The girls visited the Hardware store in Bow Island recently to learn about how much it would cost to decorate and equip a kitchen.